It can be caused by not knowing the difference between the keywords selected for campaigns and the actual search terms that users type in and click on. Yes, I’ll repeat that again – the keywords that you bid on aren’t necessarily the search terms that you are paying for when someone clicks on your ad. Here’s an example. A new client of mine that runs a carpet cleaning business was bidding on what he thought were carpet cleaning keywords (and indeed they were). Unbelievably he was paying up to £7.50 per keyword (a ridiculous cost per click, particularly when he had a £10.00 per day budget). After reviewing the search term report I quickly found that he was paying for clicks on search terms as broad as ‘oven cleaning’ and ‘driveway cleaning’. This is far from an isolated occurrence. 3 recent clients in the cleaning business had exactly the same issue. Now the client had set up the campaign themselves, yet he had been given advice from a Google Specialist and still had these issues. In fact all 3 of the clients either had a Google Specialist on board to help set up the campaign or a top AdWords Agency. How do you end up bidding on keywords and getting totally irrelevant terms? Well it’s to do with match types. When you bid on a keyword, you can decide whether your ad is triggered when someone types in the exact keyword, a matching phrase, or whether the search term broadly matches your keyword. Placing or omitting special characters around your keywords can tell Google the match type that you wish to use. If you write your keywords with the [ ] around them, then the keyword and search term will always be exactly the same. If you use phrase match e.g. “carpet cleaning”, then the search term always has to follow that sequence. So a search for cheap carpet cleaning would trigger this keyword but carpet and upholstery cleaning wouldn’t. If you used the plus signs before the keywords eg. ‘+carpet +cleaning’ then the search term just has to have these keywords anywhere in the search term, so your ad would be eligible for a search on ‘carpet and upholstery cleaning’. Below is a screenshot of keywords, their match types and the possible relevant search terms. Broad match is the money killer. 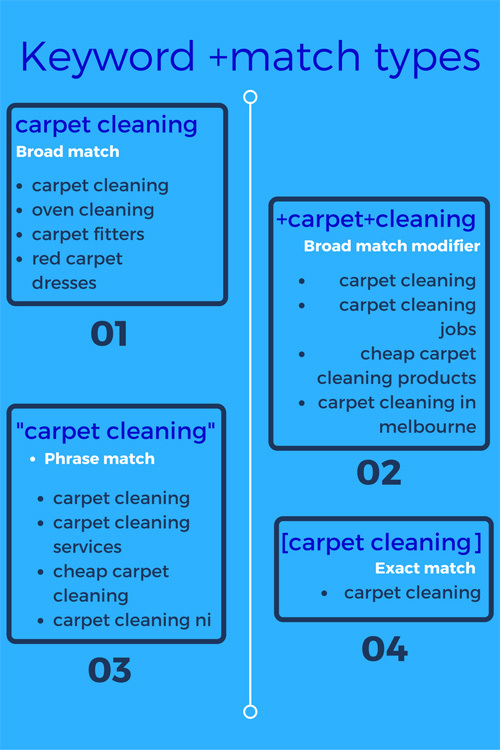 In this case the client was bidding on ‘carpet cleaning’ in broad match and it was up to Google to decide whether searches for ‘oven cleaning’ were relevant to the keyword. Google mistakenly decided they were. The client was unaware of how to use all the features of Google AdWords and hence didn’t know where to check to see the actual search terms. My preference is to go with broad match modifier terms. This match type provides more search volume than exact match, and yet still keeps things pretty relevant. Running search term reports will show you what search terms you’re getting clicks for. Make sure that any terms you don’t want to pay twice for are also added as negative keywords (these are terms such as ‘free’, ‘how to’ etc. that you use to stop your ads from showing). It’s certainly worth getting a health check on your account from a Google AdWords specialist like myself to make sure you’re not making critical mistakes, particularly if you’ve set it up yourself. Thanks for reading, I’d love to hear your thoughts and if you have any questions feel free to give me a shout!